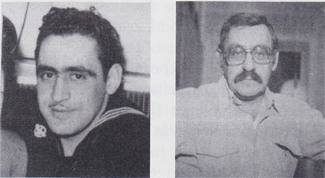 Blaise "Barney" Lepre, Water Tender 2/c, born May 30, 1925, Brooklyn, NY He joined the USNR in June 1942; was stationed at NTS Sampson, NY; University of Minnesota Engineering School; and in the USS West Virginia, 1943-46. Discharged in April 1946 with the rank of WT2/c. Received the Philippine Liberation Medal, six Battle Stars, Iwo Jima and Okinawa Battle decorations. Married Virginia (RN) and has three children and four grandchildren. Their daughter is an international lawyer living in Zurich, Switzerland; a son graduated from the USNA at Annapolis; and one son is a haute cuisine chef. He retired from the New York City Transit Authority and is currently running his own contracting business. He enjoys photography as an art form, is an opera nut and loves New York.